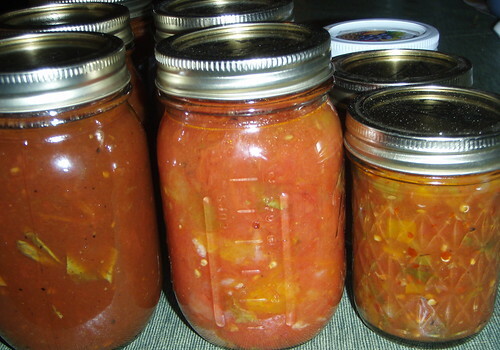 I just this second looked at the links provided by LAZ above from the Ball canning company - they have recipes for waterbath-canned pasta sauce and a recipe for herbed tomato juice which I'm guessing will work with tomatoes as well. Stupid me for looking elsewhere first. Just FYI, Vitamin C is ascorbic acid, not citric acid. You will probably have to buy the citric acid as a canning supply. Interesting that one recommended ingredient for acidification is bottled lemon juice-- is fresh lemon juice too inconsistent? C2, interesting thread! The cheapest method to purchase Vitamin C from a vitamin store, then crush them. Fruit Fresh overall is pretty expensive if you need it in any volume, which often is the case in canning. Interesting that one recommended ingredient for acidification is bottled lemon juice-- is fresh lemon juice too inconsistent? I don't know, though I would not be surprised if that choice is based on convenience and price. Glad you liked this thread. Too many of the recommendations for lemon juice in canning or preserving seem to assume that it is too much trouble to squeeze a bunch of lemons. Around here peak canning season is late summer and early fall which are also the worst seasons for fresh (as opposed to storage) lemon supply. Use lemon juice if you are working with peaches because they generally need both ascorbic acid (vitamin C) to retard browning and citric acid to lower pH. Fruit Fresh is a good way to get ascorbic acid for antibrowning action. Any Middle Eastern grocery store will carry citric acid. JenM wrote: Interesting that one recommended ingredient for acidification is bottled lemon juice-- is fresh lemon juice too inconsistent? It didn't elaborate, but my Ball Blue Book of Canning specifically did not recommend fresh lemon juice, instead recommending bottled lemon juice and/or vinegar with a minimum of 5% acidity. I was also wondering why Cream of Tartar (which is a wine by-product) isn't recommended as an acidifier, as that's what it was originally used for in wines? Or wine itself: this article suggests that a typical California Chardonnay has a PH of 3.4, more acid than bottled lemon juice - and sweeter wines tend to have an even lower PH (though I don't know what happens after you cook off the alcohol, which I assume you don't want volatile ingredients when canning) I'd rather cut my pasta sauce with wine than with lemon juice...though I suppose all this is better asked at the Extension website. My book recommends bottled lemon juice because the acidity level is consistent. Extension offices will provide answers with their researched based information. If they have no information available to them, then they won't recommend any variant. Lemon juice is so common, you will likely sensory negate it out. Inconsistent acidity in lemons is not a surprise, since it also applies to tomatoes, which is why added acid (bottled or vitamin C) is required. Canning and food preservation is much more science than art, I am inclined to stick to research based information. I'd rather not have my efforts wasted in spoilage or, worse yet, illness. This weekend, I might do some more. I think I'm hooked. I had a "romantic getaway" this past weekend: 8 jars peach chutney, 3 jars pesto, 6 jars salsa. It is kind of addictive. I'm thinking about pickled spiced crabapplesfor next weekend. For Your Canning Consideration . . . I could not find jar lifters anywhere and I was a little nervous about using them anyway. I'm not so good with tong-like things and I could see dropping the jars into the boiling water or otherwise having a hard time maneuvering them. Call me reckless, but how thrilling would it be to use your hands to reach into near-boiling water to put your jars in there and then take them out? Yeah! Also, the picture on the tag showed someone pulling a lobster out of a hot pot of water, so I figured if anything happened to me, that would be exhibit A in the lawsuit that would be filed. So, how'd it go? It was thrilling. Gloves not quite as waterproof as I'd like and the term heat resistant only means they won't melt but not that they won't conduct heat. Did I get burned? No, but there were times when my hands definitely got hot. Looking at them afterward, there were no immediate visual effects, and my hands weren't even red. I'll use them again. How were you processing your jars? I've fiddled with a number of solutions for the lifting problem, one of which only works with the jelly-size jars - but it works well - I use my spaghetti pot with the built-in drainer - otherwise I've been successful with my kitchen tongs, but I'm usually pretty good with them, YMMV. Unfortunately, it doesn't fit the pint-size jars, and I have an old quart size jar somebody gave me that won't fit in any of my pots. I generally love silicone, (except for bakeware) I have the little pincers that are the same as your silicone gloves but just cover the fingers. They work well when I'm trying to turn over a chicken in the oven or something equally messy, as I can toss them into the dishwasher when I'm done. I have jar lifters I bought at rummage sales for around 25-50 cents. WalMart has a small shelf of canning supplies that often has these lifters. I know where two are and one is spoken for. If I figure out where someone put them away to help me, then I will pass them onto you both. In a boiling water bath. I should clarify that per the USDA instructions, I set the water to 180 but then turned it up after I put the jars in. In any case, both the Ball book and the USDA specify 180-212 as the temps at which most bacteria, yeast and molds in acid foods is destroyed, depending upon processing time. Blue Book suggested 180 for acidified tomatoes, but I went higher than that. Cathy2 wrote: If I figure out where someone put them away to help me, then I will pass them onto you both. Mhays- I bought my tomatoes in Michigan - 21/lb for $9. I didn't have enough canning jars for all that I made, so some crushed tomatoes went into the fridge for use later this week. Just left Indiana on an apple-picking expedition - more about that later - and saw a "Homegrown Tomatoes, 20lb for $6" and another sign for "canning tomatoes." However, the $1 per lb tomatoes are readily available and are quite good, so I'm fine with the bird in the hand; it's more expensive than canned tomatoes but so, so much better. How many jars did you get? I have most of one set of jelly jars and most of one set of pint jars (a few gone as gifts, some still have strawberry jam to be eaten) I'm clearly going to need more. At the Orchard, we asked after jars in the shop (they had the lifter/funnel set, etc.) and the woman said "no - but I've got hundreds in my basement." Looks like we'll be putting up applesauce as well...I'll have to hit Target this week. Mhays wrote: How many jars did you get? I have most of one set of jelly jars and most of one set of pint jars (a few gone as gifts, some still have strawberry jam to be eaten) I'm clearly going to need more. 21/lbs tomatoes yielded 12 pint jars + about 1 quart in the fridge. I have 12 1/2 pint jars ready for something else (possibly chili sauce and/or apple butter) when the urge strikes again. I just bought 15 pounds of the most beautiful Japanese-hybrid apples (those Japanese know their fruit) about half Jubilee Fuji and half Shizuka (Golden Delicious and Indo cross) and I'm planning what to do with both these exquisitely balanced apples - chunky applesauce with bay leaf? Frozen apple pie filling? Apple butter? The mind boggles. Mhays wrote: I just bought 15 pounds of the most beautiful Japanese-hybrid apples (those Japanese know their fruit) about half Jubilee Fuji and half Shizuka (Golden Delicious and Indo cross) and I'm planning what to do with both these exquisitely balanced apples - chunky applesauce with bay leaf? Wouldn't Sparky like apple juice this winter? In terms of equipment, I used canning jar lifters which always appeared to be readily available. Without these, I found removing the jars rather cumbersome and somewhat dangerous. Another very useful tool was a magnetic jar lid lifter. This tool was not as easily available, but for a dollar or so, made lifting those sterilized lids from boiling water a breeze. Other than driving to Michigan, any local suggestions for sourcing inexpensive fruits and vegetables? I wonder how often that happens without anyone knowing. jygach wrote: I'm smiling as I read these posts. I haven't canned in years, and your creative endeavors are stirring me into revisiting my past addiction I have just dusted off the book that inspired many of my canning and preserving - Fancy Pantry by Helen Witty. Wonderful book. It goes far beyond canning and preserving, and I mostly used it for small-batch stuff. 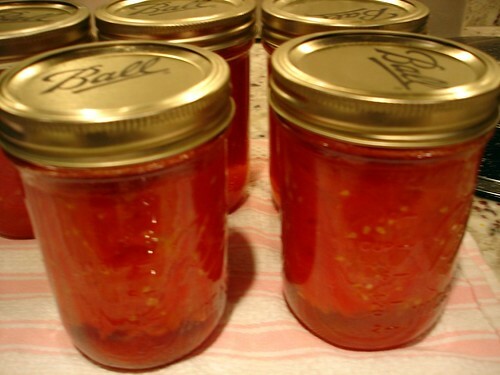 My preserving bible back in my Earth Mother days was Putting Food By, which covers canning, freezing, drying and more. jygach wrote: Another very useful tool was a magnetic jar lid lifter. This tool was not as easily available, but for a dollar or so, made lifting those sterilized lids from boiling water a breeze. Easy to improvise if you don't have one. Tie a magnet to a piece of kitchen string. jygach wrote: Other than driving to Michigan, any local suggestions for sourcing inexpensive fruits and vegetables? VI suggested that Caputo's had bushels of local tomatoes for cheap. The Ace Hardware at 3011 N Clark St (773-348-3333‎) tends to have a good selection of canning supplies. I bought a nice set of tongs there last year for a few bucks. All of it turned out really well (I ate a whole jar of the salsa by myself today - just checking to see how it tasted ) The salsa is vinegary and velvety, not traditional but still far and away better than storebought. The lighter jar in the middle is my first try at the Basil-Garlic sauce; I cooked it in a pot on the stove and didn't emulsify it much - we tried one jar, and I found that we needed a lot more sauce than usual as it was fairly light (good flavors, though.) For the second batch, I halved and seeded the tomatoes (into a sieve over a bowl, per C2) and put the cut side down on a rack over a cookie sheet (per Dobra,) and then high-heat roasted them for about 20 minutes until the skins browned and came off easily. I deglazed the cookie sheet with the recovered juice, and then sieved about half of the tomatoes directly into my cooking pot, which accounts for the difference in color. These were waterbath-canned per the instructions in the recipes. Look in the discount bins for jars and other canning supplies. This is the time of year that traditional retailers markdown the supplies. I am finally going to bed. I just canned 11 quarts and 1 pint of Roma tomatoes. I have a pitcher filled with fresh tomato juice for tomorrow's breakfast. Tomorrow, I finally do the Concord grapes for pie filling and maybe juice. Sunday evening, I pasteurized 7 quarts of fermented dill pickles and 9 pints of sweet pickles. I have more than a quart of the dill pickle juice that is destined to be the base for Polish pickle soup. My last major project for this year is fermenting 20-30 pounds of sauerkraut. My favored source for winter cabbage only had seven pounds last weekend. I'm sure there was more but a self-service farm stand does not always have a person to make inquiries to. I couldn't wait for him to drop in.